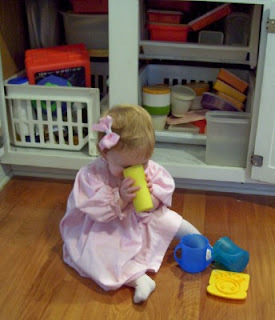 Ann of Mommysecrets has a few fun preschool ideas using Tupperware. I have mine in the lowest cabinet, and the baby makes a beeline there whenever I'm cooking. Brings back fond memories of my grandmother's canning rings tied with a piece of string! I totally have canning rings tied together in the baby toy stash--the oldies are the goodies! I enjoy your blog, thanks for making it an uplifting place to read! Amy of Mother Load sent me this pretty pink bow for Elise, so I had to show off its incredible cuteness here! Oh yes I remember canning rings too but somehow didn't think to give my first son any, I'll have to remedy that with baby #2 this next year. By the way, thanks for the regular peeks at beautiful frugality and practical living! I appreciate it even more when I browse other frugal blogs and find that somehow the topic has gone to national controversies and politics--not at all what I am expecting. Does this mean your camera has been recovered? 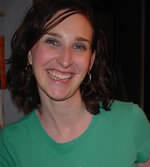 Thanks for linking to mommysecrets! I've never seen canning lid rings, but they sound like great fun! I used to help my grandmother can fruits and veges as a little girl. It's definitely becoming a lost art!